It's Megas, in all his (her?) gold-plated glory! 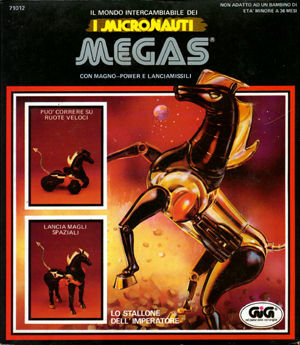 This is the Italian version of Megas which has the big, clunky missiles instead of the sleek hard-tipped ones. 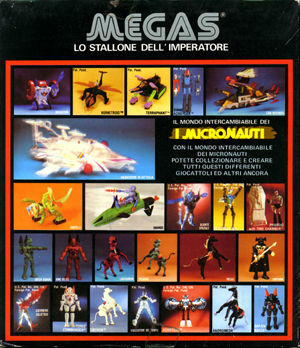 The box back is a nice overview of the I Micronauti line, displaying such niceties as Sharkos and Ampzilla, Emperor and Star Defender. Also pictured is the Hornetroid and Terraphant. It can't be seen here, but the Terraphant is shown with a sticker-covered shield over the cockpit. Most likely this is the prototype, which can also be seen in some Mego catalogs, but who knows.